Club Penguin Cheats by Mimo777 Club Penguin Cheats by Mimo777: TODAY ONLY! Buy A Nintendo DSi and Get Club Penguin Elite Penguin Force Bundle FREE! TODAY ONLY! Buy A Nintendo DSi and Get Club Penguin Elite Penguin Force Bundle FREE! Wow! This is a pretty good deal! Today if you buy the white Nintedo DSi you get the Limited Edition Elite Penguin Force game bundle Free! All for only $169! I really like the new Limited Edition Elite Penguin Force! I like the stylus. It is so very smoove. I don't have a DSi. Do you? I just have a regular silver DS. I don't have the Limited Edition Elite Penguin Force. Do you? I just have the regular version of that too! CHECK OUT THE NEWEST VIRTUAL WORLD I PLAY! i have epf and the black dsi. What stinks is that I already have a Nintendo dsi. OMG YOU ARE SO LUCKY! I only have a plain white DS! I just completed Mission 13 for the DS last night! i think an ipod touch is way better. lol just my opinion though. I don't know if you noticed, but in the epf headquarters in club penguin, when you click the huge TV, they added a new thing, it's a campfire! I have a DS and Elite Penguin Force, plus my parents prob woudnt let my get a DSi until my DS breaks which could be soon. It has a crack in it and the screen wobbles. Also my dad was like looking up DS replacement stuff. So i prob wont get a DSi sadly. What the heck a i pod touch? awesome! I might buy it! I don't have a ds or a dsi OR a i pod touch! I only have a Wii. And a N64. I know how to unlock charcters in super smash bros brawl. All you have to do is get them in the subsace essrmarry! Can you buy the new club penguin game or do you have to buy the bundle? i got a nintendo dsi, but i got the regular club penguin elite penguin force too. I wonder what the difference between the regular elite penguin force and the limited edition one is !? As far as i know the camfire has been a TV channel since Tvs came out as an igloo furniture item and its always been in the command room. Ds still works with the game. DSI isnt much better to be honest, just the camera really. At least you have something. I used to have nothing, now i have a laptop with no internet connection and a ds and an xbox 360 and the new ipod nano with video. Im angry! Like a 2 onths ago I got the EPF game for $50 now its like $30 and it is the limited editition and coomes with a free puffle! Narutojudo said... Whats the difference beetween the normal game & the limited edition game? The normal game just comes with the game & coin code! The limited edition comes with a stylus & the EPF Skin for your DS! I have a nintendo dsi, it's awesome! I have 2 Dsis a blue one and a black one i alson have epf beat it already. now i really want a nintendo DSi! Sorry, but it was there already. It is part of business. When the toy is new, it causes more, but when hte toy is older, it gets cheaper. Thats why i wait a little for it to go cheaper and better deals. Mimo I have the exact same DS as you! A silver DS Lite! I also have the CP EPF Collector's edition. It's pretty sweet. Mimo... I don't know if you knew this already or not, but they changed the DJ3K game on Club Penguin. Now you can choose to "Mix Music" on either the Classic Track or the Jungle Track. If you haven't already seen this or posted it... please give me credit! Thanks a bunch! I had a DSi 2 days after it came out. Got it for about 69 bucks, traded in my DS Lite so it's cheaper. But I WANT Club Penguin: Elite Penguin Force Collector's Edition! Their is new music. hopw i get credit for this. Awsome! I am gonna get epf for my b-day. Hope you get one. Hope your dad cant find any replacment. I have a DS Lite. I will get the one that comes out after the DSI. Mimmo doesn't like CAPS. Not to tattle though. Good question. The limeted addition comes with excesieres (hope I spelled it right. I am a terrible speller.) like DS skin and a styllus. Hope that helped!!!! i have a ds... im asking 4 a dsi 4 christmas. I love dsi's they r kewl. haven't said that in a long time! I have a DSi and the normal CP game. i have the regualar edition and i have a balck ds lite i wish i had the dsi! not a dsi but i have the club penguin collectors addition!woot woot! you know what's wierd? why my parents don't let me buy my own things. i want a DSi and I can buy it with my own money, but my parents won't let me get it. No, you can just buy the game. Hope that helps! I have a blue one. Well, lol, i just have a Gameboy color that hardly works! So consider yourself lucky... i don't have cable, either. Lolz! Just Birdygurl with cool characters. An iPod Touch is an iPod with a touchscreen! My friend has one, and they're wickedcool! I think you can buy just the game, too, but all the same it's a great deal! Same here! Isn't it ANNOYING? My parents say it's a "time waster," but i COMPLETELY disagree! 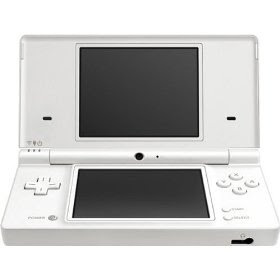 To tell the turth the DSI is porbitly simalar to the DS lite, or the regular, it has just a impoved version the DS lite, I have seen the comucail for the DSI and it just has some features that the DS lite doesn't have and you can do thoughs thing that were in the comucail on the computer. It's a good thing you dad is looking up a replacement stuff for you DS because a new DS cost a lot and with the way things are going now it's best to spend less. Be wise and be careful with the DS you have. 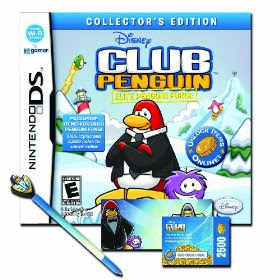 i have a blue dsi and have the oringanl epf i got the dsi a month when it came out but idk if they made the collectors version yet then. What about the Internet, or the voice change thingy? ive already got a dsi but not cp epf i have a blck dsi!! becasue i won a ds lite but then it broke and i got a dsi. I don't. I guess im not gonna get it! I have a blue DSi with the regular EPF game. Do Nintendo DS games work in DSi? P.S.ONLY 18 DAYS TILL CHRISTMAS! I have the DSi...I will tell you that it is pretty cool!I have it in black!But I have the regular version of EPF! can you help me join weeworld its not letting me im getting kinda mad plz mimo tell me how!! Hey guys its crazy30278 i knoww it's not the right place to put this but my penguins b-day party is on half pipe at 6 oclock in my igglo. k bye. Same here, Mimo. I have a regular DS, and regular CP DS game. I have a DSi! I got it for my birthday in May. It's pretty cool! I think you should do whatever you want to do. I'm always sad to see people leaving CP, so many people leaving.... i wish i could get the point across to Club Penguin that their new member stuff is making penguins quit, and thats what causes lots of these people to quit. I at least think you should stay for the Christmas Party, because its always fun. After that you can quit! Of course, i dont WANT you to quit, but i guess i can't stop you. p.s. i stopped doing the cool character Birdygurl way of stuffs, lolz. Hi Mimo777, We still like your site but, it makes us sad that you haven't answered our question about your name. All you would have to say is yes or no! Mentjr, Sweky3, All4hez, Bellzz4, All4hezmom, and Chobsz. Hi mimo777, how com you posted that comment about "a partridge in a pear tree means Jesus on the cross" but you won't post our comment about if the sevens in your name come from the bible? From Sweky3, Chobsz, Bellzz4, All4hez, Mentjr, and All4hezmom. i got the original ds on release day , my ds broke 2 days before my birthday so i got a ds lite for my birthday , that broke, i got a new one then a while later i bought a dsi with my saved money. Im sure he is delighted that you are helping him with the cheats. Happy for you having the dsi already. Have fun. Sorry to hear that you cant get the dsi but maybe you can get it for christmas or save up for it. The ipod touch is an ipod with a touch screen. You dont have to buy it in the bundle but you can if you want. i agree, the colours and very nice. I have a ds lite too. You shouldnt keep anoying mimo, if he doesnt want to answer the question he doesnt have to. I have ipod touch, wii, xbox 360, ds, labtop, and ipod nano! Cool!I have a DS but not a DSi. Sorry if we were annoying you we just want a yes or no, but we'll stop asking. its about time you found another site. finaly WeeWorld and mimo BEST DAY EVA! my white ds broke and i had the chance to get a dsi but i wanted the gameboy advance slot so i got a sliver one! i had to sell so much stuff.